In 2006/07 the farm gate value of the aquaculture industry in South Australia output was estimated at nearly $208 million. In n 2001/02 there were over 1,170 jobs generated directly in aquaculture and almost 1,500 flow-on jobs generated in other sectors of the State’s economy. For example, aquaculture helps generate employment in industries like boat builders, feed suppliers, net makers, training providers, business service providers and more. The industry also supports other industries involved further along the supply chain such as processors, wholesalers, retailers, transport companies and so on. 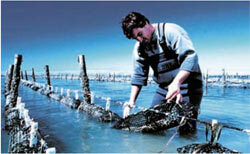 In the 1990’s, South Australian Government’s began support of aquaculture through the initial funding package known as the Farmed Seafood Initiative (FSI). The industry’s target is to achieve $1bn in gross revenue by 2010 from the South Australian aquaculture industry from farm gate sales of around $650 million. There is a great potential for further growth, not only in more established sectors such as tuna and oyster farming, but also in marine finfish, shellfish, biotechnology and land-based aquaculture. South Australia’s coastline provides numerous locations for aquaculture and the environment needs to be protected to ensure there is stable and sustainable growth. It is therefore essential to provide a comprehensive legislative, regulatory and administrative framework. The species being commercially farmed in South Australia waters and on which research and development has been carried out include abalone, Atlantic salmon, microalgae, mussels, Pacific oysters, Rock lobster, snapper, tuna and yellowtail kingfish. Land based farming involves yabbies, marron, barramundi, freshwater fish and inland saline fish. Tuna followed by oysters and abalone were the largest industries. These are farmed in the marine environment in sea cages and on longlines and racks, as well as onshore in recirculation systems, in flow-through raceways and tanks, and in static or low flow rate ponds. The major areas for aquaculture are the Lower Eyre Peninsula, Kangaroo Island and the Investigator Strait and the South East coast. SARDI, the South Australian Research and Development Institute, supports an Aquaculture science program providing scientific and technical advice across government, industry and the community on key issues associated with the sustainable development and management of aquaculture in brackish, freshwater and marine environments.